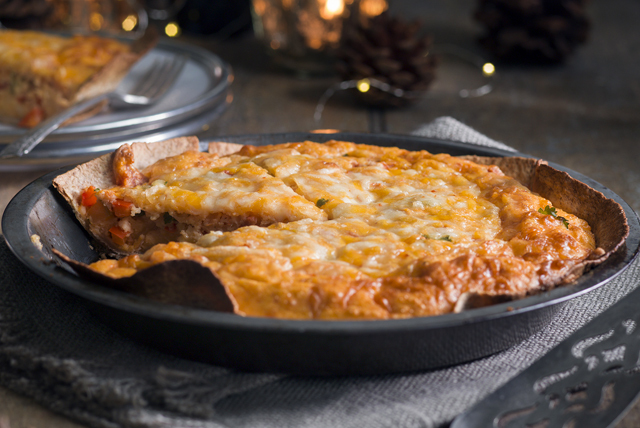 Tex-Mex Vegetarian Tortilla Pie is a delicious and satisfying vegetarian pie made with eggs, salsa, milk, peppers and Cracker Barrel Shredded Habanero Heat Cheese. The crust is made with tortillas so it couldn't be easier to make! Spray 9-inch pie plate with cooking spray; line with tortillas, overlapping as necessary to completely cover bottom and side of pie plate. Sprinkle half the cheese onto bottom of crust; top with peppers and cilantro. Whisk eggs, salsa, milk, flour and baking powder until blended; slowly pour over filling in crust. Top with remaining cheese. Bake 25 min. or until knife inserted in centre comes out clean. Let stand 5 min. before cutting to serve. Serve with a tossed green salad topped with your favourite Kraft Dressing. Prepare using Cracker Barrel Shredded Tex Mex Cheese or Cracker Barrel Shredded Creamy Mexicana Cheese.